Size: M , L , XL , XXL. Womens gorgeous solid white spaghetti manufactured of 100 % biowashed cotton single ersey knitted fabric. 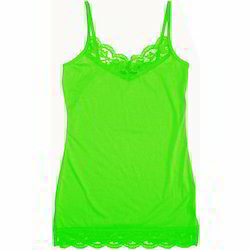 Our company holds vast experience in this domain and is involved in offering Ladies Spaghetti Top. Leveraging on the dedication of our qualified professionals, we are able to provide an unmatched quality range of Anjali Slip Spaghetti Top. Our offered range is delivered by us at clients’ end after checking against different parameters of quality. We are engaged in providing superior quality Blue Spaghetti Top to our most reliable clients. It is a solid dyed voile top with lace. Available in different shapes, sizes and color combinations, our range is made from qualitative raw material and can be availed at industry leading prices. With an established reputation in this market, we are involved in providing Ishin Viscose Black Spaghetti Top. - Quality 100% pre-shrunk cotton (cotton/polyester blend for gray color), heavy weight fabric for a comfortable feel. Fit is women standard fit (size up in doubt). - designs are professionally printed. Your unique design will make someone smile with funny, cute, vintage, or expressive artwork.